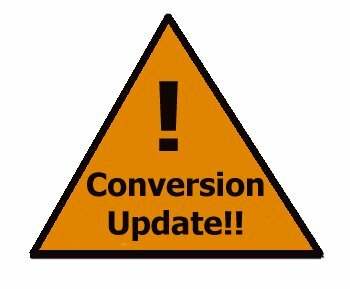 Conversion Update! – Statcounter Blog. We’d like to take this opportunity to update you about the conversion to the new SC4 system and also answer some queries that have arisen. Do I need to install new code to use SC4? No! All existing StatCounter projects will be converted to SC4 so that all members will be able to enjoy the new features available. I installed the beta code – what do I do about this? When your standard StatCounter code is converted to SC4, you can simply delete the old beta code on your site. This is because your standard StatCounter code will start to collect all the new stats previously only available with the beta code. Why can’t I see download stats or exit links in my stats yet? Only one of our 40+ partitions has yet been converted to the new SC4 system. Once your partition is converted, then you will be able to enjoy the new stats! What partitions have been converted so far? Partition 3 (c4) is the only partition to have been fully converted as at July 11, 2008. Updates about conversion of further partitions will be posted in the Service Status area of our forum. But I want to see download stats/exit links NOW!! If you want to start tracking downloads or exit links immediately, then you could consider setting up a new project and adding a second lot of StatCounter code to your site. All new projects generated are automatically created on the new SC4 system. When your standard StatCounter code is converted to the new system, you can then simply delete the temporary code you added. Why is conversion taking so long?! Converting a full partition takes approximately one week due to the volume of historical data which has to be processed. Conversion of the first partition took extra time as we had to tread carefully and heavily monitor the conversion to make sure that nothing untoward or unexpected happened. We are now in talks with a number of data centers in order to locate the best equipment, service level agreements and prices – continued conversion is postponed until we reach agreements with some of these third parties. Is there anything that StatCounter members can do to help? We are already so grateful for the help we receive from so many of our members – your unfailing encouragement and support are invaluable. In addition though, if anyone can recommend and provide contact details for colocation or datacenters, we’d be delighted if you could post the information below! Statcounter was already the best and it keeps on getting better. Many thanks! I provide co-location and other hosting services out of my privately owned data center facility in Charlotte, NC. I would be glad to give you some options to consider. I am excited about the conversion. You guys offer THE BEST free service on the internet. As soon as my website income enables me to, I will upgrade! Thanks for all your hard work. I always have loved the service you provide, and the blog you have here is a great help on researching my Distance Education courses. I look forward to more of the upgrades. I just wonder what sequence does the conversion follow? Simply, Partition 3 (c4) will be followed by partition 4 (c5) or you are reversing back to partitions 1 and 2? I noticed after the conversion I was missing a break after the statCounter display. Prior to the conversion the jpg after statcounter was on a different line. After the conversion statcounter and the jpg ended up on the same line. I have added after statcounter in my html, just figured I would let you know what I observed. We house companies that range from news organizations, educational institutions, record labels, television broadcasting companies, entertainment companies, automotive companies, financial institutions, petroleum companies, etc. Let me know when would be a good time to talk. I agree and I recomend statcounter. i am fully satisfied with statcounter & Statcounter is one of the best free services.